Our designer and cabinetmaker team will be on hand all through your bathroom redesign project. We are at your service to meet your needs in terms of design, features, colours and materials, before providing you with a 3D view of your bathroom design, including made-to-measure units that will perfectly match the space available. All the stages of your project are developed on site in our workshop: we provide a 3D design for your contemporary bathroom, manufacture the units in our workshop near Aix-en-Provence, and then personally take care of the installation in your home. > HOW A PROJECT WORKS ? Create the bathroom that suits you. Choose from a wide range of colours and materials. You can change your mind until you take a measurement. Visit our carpentry workshop in Peypin, between Marseille and Aix-en-Provence. Our carpenters are passionate about wood and their work. We draw your project in detail before manufacturing. You can see your project in 3D reality so you can see volumes and materials. In bathroom interior design, it is important to make use of the little nooks and crannies and available space. 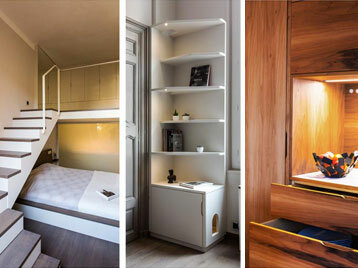 We design made-to-measure bathroom units, like, for example, a tall unit with mirror doors and built-in lighting, a corner unit or a made-to-measure bathroom cupboard to hide a boiler or a badly placed radiator. We can provide a range of different materials for your luxury bathroom units, including oak or teak. 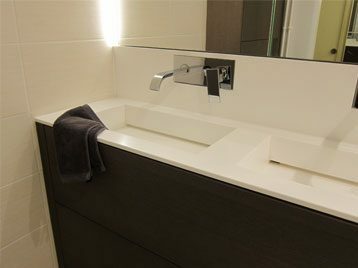 We can take care of all the complex elements such as installing mirrors and glass panels for walk-in showers and baths. Are you a fan of wood? Do you prefer white lacquered materials? Choose from a wide range of colours and materials. See all the different bathroom storage elements – a tall unit with mirrors, a cupboard or a corner unit, everything is possible. Would you like a mobile laundry basket or a magnifying mirror? Choose from a wide range of accessories. 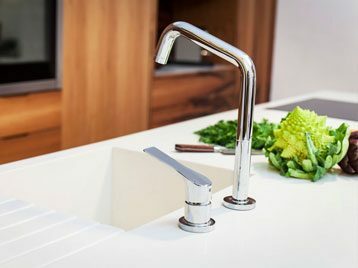 We can provide all types of made-to-measure washbasins from Corian® Corian® or Himacs®. For elegant and contemporary bathroom designs, we work with mineral resins that can be moulded into any shape – simple or double washbasins, round or square – we can do it all. Surfaces are soft to the touch, hygienic and non-porous, with no visible joints. The result is a simple, elegant and beautiful bathroom design with a single smooth surface. The washbasin of your dreams. Choose from a wide range of colours and materials. Are you looking for a geometric-shaped washbasin? Do you prefer rounded angles? Everything is possible! Take a look at our projects to get some ideas for your own washbasin unit in the bathroom of your dreams!